Learn more about Weiping Zou, MD, PhD's research at the Michigan Medicine Rogel Cancer Center. New crash test dummies model obese and elderly drivers. The "Buddy Button" will increase comfort and safety for children with feeding tubes. Scientific curiosity and a deeply human commitment to improving our patients’ quality of life guide our researchers at the Department of Surgery. Our research spans basic science, translational, and health services investigation, and our impact speaks for itself: In 2017, we ranked #1 for National Institutes of Health funding, with a total of more than $35 million in extramural support, and we publish more than 900 papers annually. At Michigan Medicine, we expect our surgeons to not only operate but also shape the field of surgery. Supporting innovation allows our faculty to become leaders in developing technology that will change how we operate and care for patients. Our goal is to create transformative innovations that will advance the field of surgery, the care of surgical patients, and to establish Michigan Medicine’s Department of Surgery as the premier institution in the nation for developing surgical innovations. 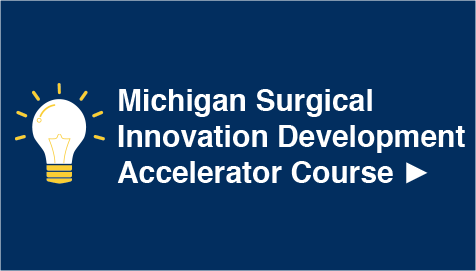 Through the Surgical Innovation Development Accelerator Course, we provide faculty with the opportunity to expand their ability to develop new technology and navigate the technology to the market. The course covers a wide range of concepts, such as idea generation, value proposition, intellectual property and patent submission, regulatory pathways, customer discovery, marketing and adoption, reimbursement and funding models, prototyping and pitching. The top four teams at the end of the course pitch their technology in front of the entire department and 3 guest judges at a Shark Tank-style Grand Rounds.  SIDAC is supported by the Michigan Surgical Innovation Prize, a $500,000 fund provided through the Michigan Promise, which is distributed to the top teams who complete the course. Faculty and trainees in the department benefit from extensive physical and intangible resources — from more than 50,000 square feet of research space across the U-M medical campus, to a departmental tradition of openness that encourages investigators to work together. You can see this collaboration in the way that we’ve organized our labs at U-M’s North Campus Research Complex, a 28-building scientific and administrative facility. In this multidisciplinary environment, cancer biologists, pharmacologists, engineers, health policy researchers and others work side-by-side. In just one recent example, a basic scientist has partnered with a biomedical engineer in order to study how miniature organoids could enable tissue transplantation for the treatment of diabetes. Within the department, this support includes incentives not just for clinical effort, but for research as well, with some faculty spending up to 60 percent of their time on investigation. This freedom enables faculty to accelerate advances, and to invest more time in mentoring the residents and fellows who will become our future colleagues. Research training opportunities begin at the undergraduate level, through programs that ignite scientific interest and teach skills in professional scholarship. Our Academic Surgeon Development Program engages students with hands-on contributions to clinical and research projects, and provides travel funding for students whose work is accepted for presentation at national conferences. At the GME level, we offer training to more than 140 residents and fellows across 10 specialties and sub-specialties. Our residents frequently lead the Medical School in number of publications — just one measure of research excellence among many. See how entrepreneurship is making an impact on health by bringing new ideas to market. Find information for prospective residents, fellows, and other trainees.